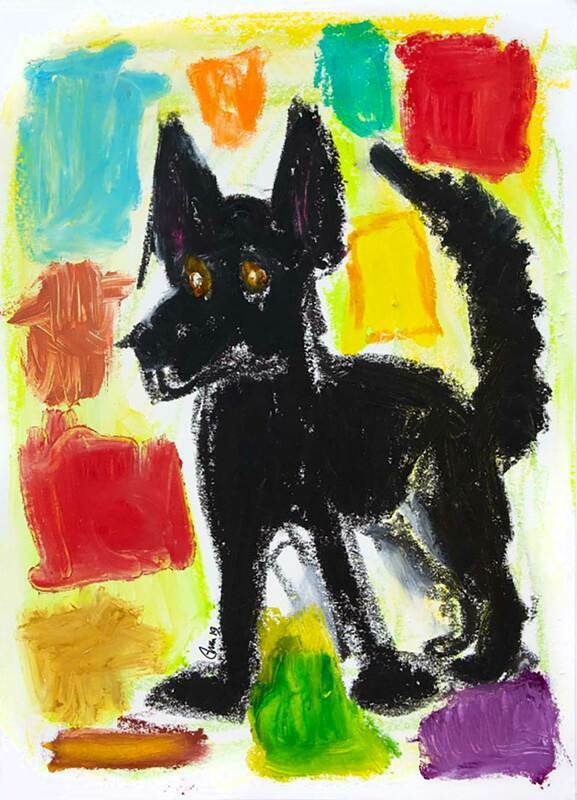 I love dogs and bold colour and shapes and they combine energetically in this piece titled "Adventurer". Dogs love to roam and sniff out new places and things and that's why it's so darned hard to find them if they should sneak out of your yard, which my beagle did once. I was mortified. It was night time and I thought I would never find her. But, luckily, her absolute reason for living, which is her love of food, kept her nearby in a neighbour's yard and they had just put out their garbage on the ground by their back fence. Thank goodness! This piece is a 9" x 12" original oil on paper. Oil pigment sticks are oil paints (not pastels) and they dry and harden like regular oil paints.